A box of Polaroid photos shot by famed-photographer David Bailey in the 1970s, and hidden away ever since, has been revealed for a new exhibition. 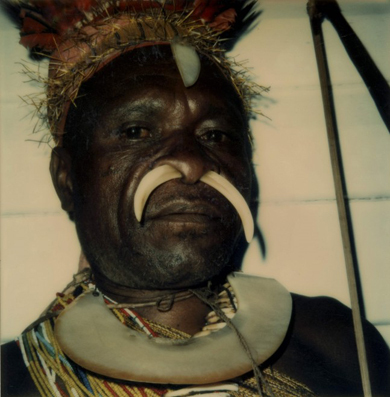 ‘In ’74 I photographed the cannibals in New Guinea,’ said Bailey. The resulting images are due to go on display at the Daniel Blau gallery in London from Friday. A gallery spokesman described the find as a ‘treasure’, adding: ‘Today indigenous peoples are gazed at – and possibly even envied by us – for the seemingly simpler and more understandable world they inhabit. The exhibition runs until 3 November at the Daniel Blau gallery, 51 Hoxton Square, London N1 6PB.